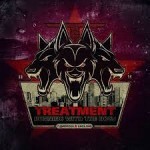 Share the post "Album review: THE TREATMENT – Running With The Dogs"
The Treatment are a band who have lived a bit of a charmed life so far. Their first album ‘This Might Hurt’’ was recorded in the studio of Steve Harris from Iron Maiden and in the last couple of years the guys have supported some of the biggest bands around, including opening for the Motley Crue and Kiss tour across the USA, not too bad for five guys from Cambridge. The band have now managed to find time in their busy touring schedule to return to the studio and record this new album, entitled ‘Running With The Dogs’. Once again the band have dug out their classic rock record collection for inspiration and marry together the best bits from the likes of AC/DC, UFO, Def Leppard, Thin Lizzy, the list goes on. It would be easy to write them off as a tribute act of sorts but that would be to sell the band short as they take these elements and bring them bang up to date with some clever writing and plenty of attitude. Opening track ‘I Bleed Rock n Roll’ is a perfect example of this, there is a definite AC/DC influence in the riff but the track is infused with an energy that makes it sound fresh. ‘Drop Like A Stone’ continues with the same driving energy and possibly just a hint of Alice Cooper in the melody, a plus point in my book. One of the early album highlights is the track ‘Get The Party On’ which I could see becoming a live favourite. Other tracks of note are ‘ Emergency’ which nods in Def Leppard’s direction, ‘The Outlaw’ which starts with an excerpt from the old Wild West before hitting the mean streets of downtown LA circa 1985, and the laid back ‘Cloud Across The Sun’. No classic rock album would be complete without a heartfelt ballad and the guys don’t disappoint with ‘Unchain My World’, a well crafted acoustic number with a big chorus, it ticks all the boxes. This entry was posted in ALBUM REVIEWS, ALBUM REVIEWS (Mobile), All Posts and tagged AC/DC, album, Alice Cooper, CD, classic rock, Def Leppard, Kiss, metal, Motley Crue, review, rock, Running With The Dogs, The Treatment, Thin Lizzy, This Might Hurt. Bookmark the permalink.